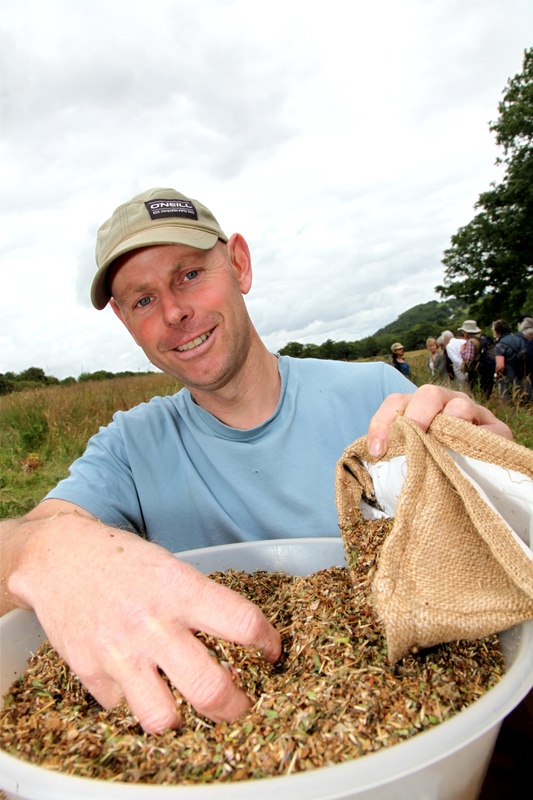 If you’re planning to develop a meadow over an acre or more in Wales, it might be worth seeing if there’s some grant money available to help with purchasing our seed. Bumblebee Conservation Trust have been very helpfully supporting bee-friendly meadow creation projects in Pembrokeshire. If you’re in or near the Pembrokeshire Coast National Park, you could try their conservation team for financial or practical assistance. Remember that seed really needs sowing in the autumn – between August and November is ideal. Spring sowings are not recommended. Give us a ring or send an email if you’re not sure how much seed you’ll need. Have a look at the sowing rates below, or give us a rough idea of your area and we’ll work it out for you. We reckon one of our 250g bags gives a fair coverage over 100 square metres. Because of the low-tech methods that we use to process our harvested seed (sieves! ), your seed mixture will contain fragments of leaf and stalk. Expensive seed cleaning machinery is beyond our reach! Our prices are lower than those of the larger English meadow seed mix suppliers to reflect this. A sowing rate of at least 5g/m2 is recommended to take account of the chaff. We take orders by email, and payment by BACS or cheque (sorry, no credit cards). We have no on-line ordering system as we prefer to have personal contact with customers.